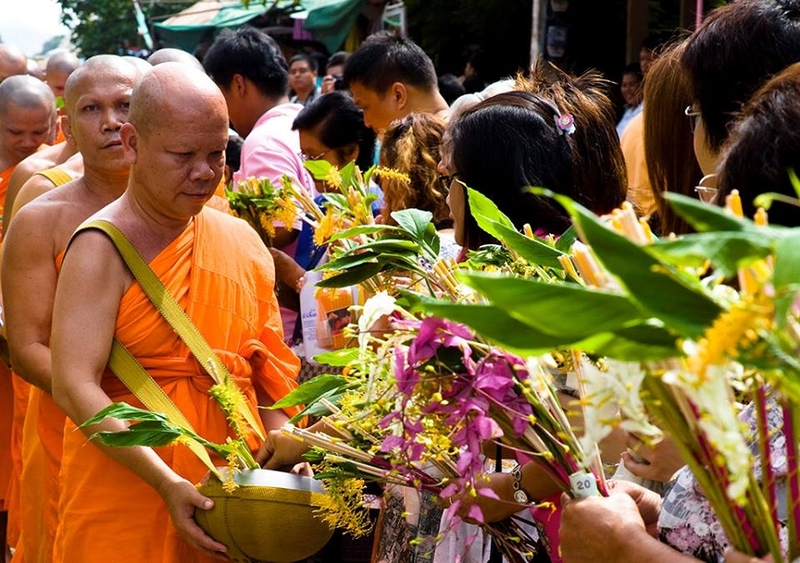 Wan Khao Phansa [วันเข้าพรรษา: wan kâo pan-săa] is a period of three lunar months during the rainy season when monks are required to remain in one particular place or temple [วัด: wát]. This year it runs from July 31st to October 27th 2015 (Wan Awk Pansa : วันออกพรรษา). This tradition originates from old times when Buddha stayed in temples during the rainy season to avoid killing insects or harming the growing seeds. It is a period for study, meditation and teaching of new monks. The monks are allowed to go out during the day but they must sleep in the same temple every night during these three months. 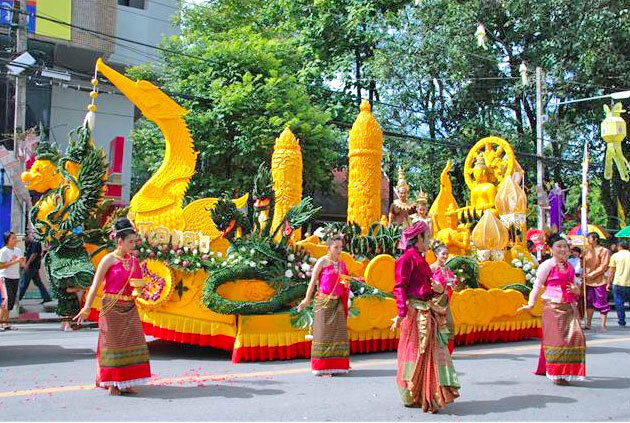 Mostly the activities o­n Wan Khao Phansa (Rains-Retreat Entry Day) are same as those o­n any other Buddhist holy days. Two main important things presented to monks during Khao Pansa are the candles and garments worn by monks, especifically the bathing robe. In the old times there was only candle light to be used around the temple, and on the entry of the rainy season, Thai people made large candles as offerings to be used during this season. Some believe that as a result of this custom, they become brighter, and smarter – similar to the characteristics of the candlelight. This tradition passed on from generation to generation and it is still present today. One important tradition for Wan Khao Pansa is “Khao Phansa Candles Making Ceremony” (ประเพณีหล่อเทียนพรรษา) where people bring white and yellow candles to make the Khao Phansa candles. Also “Candle Festival” is the major event occurs on this day. 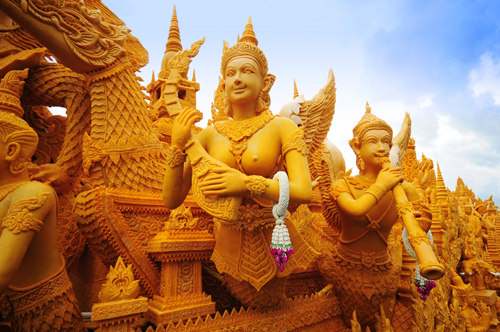 The most famous of Candle Festival locates at Ubon Ratchathanee province, at Thung Sri Mueng temple which is the province’s most popular annual event. Local artists express their artistic talents and techniques through crafting and placing Thai pattern with the candle. The magnificent candles also demonstrate the link of local custom and religious belief. After the procession, they are presented to local temples. **Wan Khao Phansa is also the national “No alcohol day”. All venues are prohibited from wholesale or retail distribution and sales of alcohol, except hotels. The government also encourages their people to stop drinking during these three months with the campaign งดเหล้าเข้าพรรษา [Ngod Lao Kao Phansa]. I’m not ure about Kata but I think it’s a magic word that an old man or woman can say good word/phrase to their children. “kata” is from Sanskrit and in that language it means “word”. Khao phansa is literally “Rice rainy season” and awk phansa is “Exit/leave/end rainy season”. No alcohol day?! I’m not sure. Are you?